Mark Webber has rekindled the animosity between himself and his prospective Williams team-mate Antonio Pizzonia. 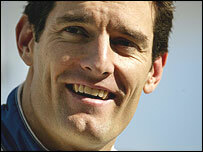 Webber has accused Pizzonia of telling lies for saying they did not have equal cars when team-mates at Jaguar in 2003. "He knows he's told lies. He says his car was different to mine? If he really thinks that, then he's a loser. "The truth is that Antonio was fast in testing but couldn't repeat it in races," Webber told Italy's Gazzetta dello Sport newspaper. "This year when he replaced (Marc) Gene in Ralf Schumacher's Williams he raced well, but he didn't have much pressure to bear because he had nothing to lose. Things change when you're a starter, especially when you're in a Williams." Pizzonia, Williams' official test driver, is the hot favourite to fill the team's vacant second race seat alongside Webber. The team have a position to fill after they lost out in a legal battle with BAR for the services of Jenson Button. The row between Webber and Pizzonia has its roots in the Brazilian's disappointing performance at Jaguar. Webber comprehensively outpaced him, and Pizzonia was sacked midway through the season and replaced by Briton Justin Wilson, who also failed to match the Australian. Pizzonia faces opposition from German Nick Heidfeld for the Williams drive, with David Coulthard's chances looking slim. Webber said he regretted Williams' failure to land Button. "It's too bad because Jenson showed with BAR that he's a great professional."